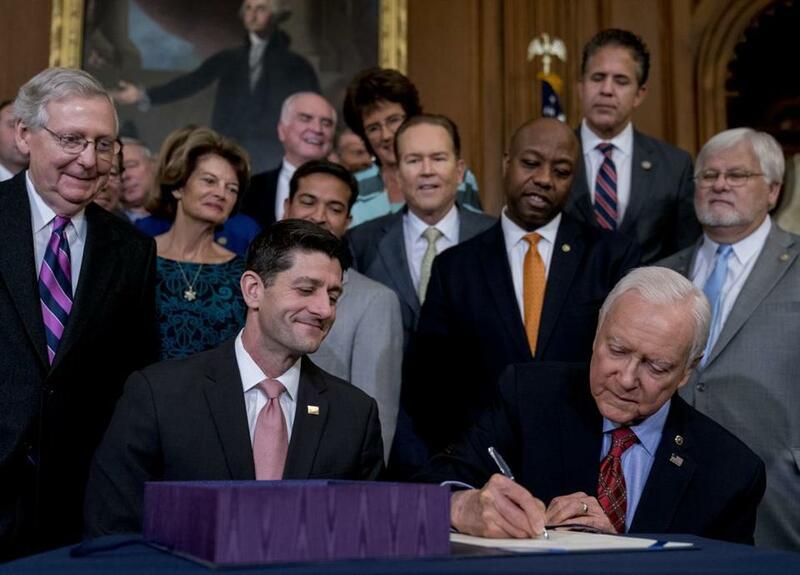 Senator Mitch McConnell (left), House Speaker Paul Ryan, and other lawmakers watched Senator Orrin Hatch sign the final version of the GOP tax bill. WASHINGTON — President Trump is spending the holiday season reveling in his tax overhaul victory, but the new year may bring bad tidings as evidence mounts of a coming backlash in the 2018 midterm elections. With control of the House and Senate up for grabs next November, many political observers see evidence of an increasingly favorable political landscape for Democrats. “In the races we’ve seen since [the election], Trump has been a drag” on the Republican ticket, said Jerri Ann Henry, a GOP strategist in Washington. Henry said she’s not ready to bet the House will flip to Democrats, but she’s moving in that direction. Early signs of a groundswell have already emerged. A spate of long-held Republican state legislative districts have flipped to Democrats in special elections across the country, including in conservative states such as Oklahoma, South Carolina, and Iowa. On Dec. 12, Democrats dealt Trump an embarrassing defeat in the Senate special election race in deep red Alabama, fueled by voters fleeing the Republican Party and an increased turnout of black voters. Last month, Republicans also lost a closely watched Virginia race for governor. The warnings for the GOP in those results are also bolstered by national polling, which has brought increasingly bad news for conservatives in recent weeks. The margin of people who prefer Democrats to Republicans in Congress has reached its largest point in decades. Voters currently say they prefer a Democrat-controlled Congress by about 10 points, according to a FiveThirtyEight average of recent polls, which is the largest margin in such generic ballot questions in several years. This coincides with summer data from Gallup, which said there’s been a 5 percentage point decrease in the number of people who call themselves Republicans since Trump’s scandal-ridden presidency began. Multiple specialists pointed to another striking statistic: At this point in 2009, when Republicans were gearing up to take back control of the House a year later, they had about 75 declared candidates who had raised $5,000. Currently, Democrats have nearly 400 candidates with more than $5,000 — more than five times as many. A central focal point of upcoming congressional campaigns will be the Republicans’ tax overhaul, which deeply and permanently cut taxes for corporations and the wealthy, while providing only modest, temporary cuts for middle-class Americans. Democrats are already calling this a giveaway to wealthy GOP donors and special interest groups, a message they are keen to take into 2018. Over and over, GOP lawmakers have dismissed questions about a coming anti-Trump tide, and shrugged off concerns about their tax bill’s current unpopularity. Once benefits of the tax cut show up in paychecks next year, they said, the new law will become more popular. Though the plurality of Americans have said they believe the about-to-be-signed tax law is a “bad idea,” House Speaker Paul Ryan said he expects that number to turn around. Even before the unpopular tax bill was approved, Trump’s dismal approval rating, hovering between 35 and 39 percent, showed signs of weighing down the Republican brand among college-educated women and millennials. Representative Katherine Clark, the Massachusetts Democrat who holds a leadership role in her party’s midterm efforts, said she also believes anti-Trump grass-roots energy will soon translate into electoral success. One analyst said voter data in Alabama, Virginia, and New Jersey showed Trump’s 2016 voters were not changing their minds about the Republican Party, but rather Trump’s first year in office has motivated new voters to come out against him. “The fact that there’s going to be a Democratic wave, I think, is incontrovertible. What’s going to be the thing we’re looking at is the size of this wave,” said Rachel Bitecofer, a pollster and the assistant director of the Wason Center for Public Policy in Virginia. Other political analysts were more cautious in proclaiming the trends would continue through next year. Still, they acknowledged that nearly all fundamental electoral indicators look very positive for Democrats. “There’s change happening,” said Krista Jenkins, who runs the polling firm PublicMind out of Fairleigh Dickinson University in New Jersey. “There’s some headwind that the Republican Party is certainly facing, and this can certainly be a difficult year for them,” Jenkins said. Some Republicans are now asking party leadership to heed the warning signs more closely, particularly in regards to the party’s poor showing among millennials. Compared to previous gubernatorial elections, voters ages 18 to 29 nearly doubled their turnout to back Democratic candidates for governor Phil Murphy and Ralph Northam, who won in New Jersey and Virginia, respectively. Republican pollsters also point to another data point: that young Republicans, who are already few in number, seem to be increasingly hard to find. John Kasich, the Ohio governor who ran for president against Trump, recently said Republicans were “losing the future” by “turning off millennials.” Recent results have shown a “credible case” that Trump is hurting the party’s brand among young voters, said Evan Siegfried, a Republican strategist and author of a book on millennials and the GOP. Since Trump’s election, “we’re seeing a more engaged millennial side than we normally do,” Siegfried said.